The Brooks Caldera, at 9.9 oz. (10 1/4 for my size 10) fills a long overdue niche in the Brooks trail shoe line, a shoe that is lighter, more flexible and more responsive than the popular Cascadia, yet still offers enough cushion and protection for long distances. With a 25/21mm stack and 4mm offset, the Caldera offers an excellent combination of all day cushioning with (long) race ready performance. 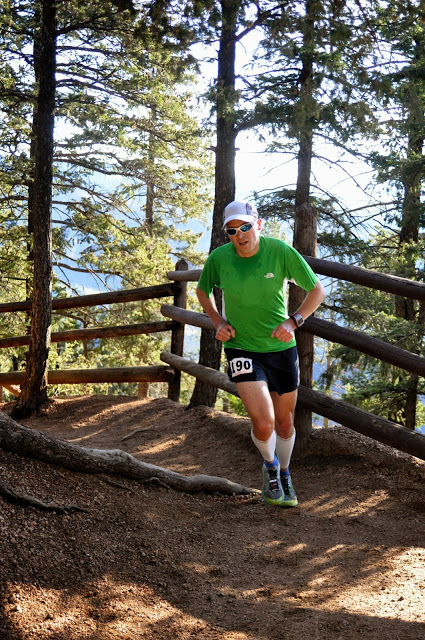 The upper is more voluminous and accommodating than the Cascadia, thus satisfying a wider range of users, yet the upper is secure enough to provide good security when pushing the pace, or in technical terrain (though for smaller feet, a bit of movement when pushing the pace ON technical terrain. The double mesh upper of the Caldera is loaded with structure and overlays, yet remains flexible (due to the somewhat stretchy material), compliant and well ventilated. The overlays do a great job holding the foot in place, even though for me, my low volume foot did not fill out all of the space entirely, especially in the forefoot. Lacing is very secure, which helps to hold my midfoot quite securely and the stretch woven laces are a really nice touch, allowing for perfect tension (that holds through the course of a run) on the first try. The upper, though not entirely seamless, has a seamless feel and is exceptionally comfortable, with no rubbing or hot spots. Fit is true to size. The Caldera has some of the best laces I have used. There is also a lace garage on the tongue, which I tried early on, but eventually forgot about. A nice touch though if you feel you need it. The toe bumper is really solid, but unnoticeable while wearing the shoe. Excellent structure, making the Caldera very protective and stable. The toe box is on the wide side and should accommodate a wide range of feet. The heel counter offers excellent heel hold, good padding and is just the right height. The Caldera also has a built in gaiter tab, a nice touch, but something I have yet to use. The tongue is of medium thickness and gusseted. The midsole consists of Brooks proprietary BIOMOGO DNA cushioning, which, in the Caldera, is very plush, yet firm and responsive enough for pushing the pace at higher speeds. Cushion and comfort is ample for all day outings and ultra events. There is no rock plate in the Caldera, which I initially assumed would be a liability for me, given the rocky trails that I run, but ultimately turned out to not be an issue, as the cushioning protects from just about any impact. The Outsole of the Caldera consists of a patchwork of low profile lugs of varying rubber compounds glued to the DNA. Despite the low profile of these lugs, they provide surprisingly good traction through a wide variety of surfaces. The rubber compound(s) are reasonably sticky and offer above average traction on rock and in wet conditions, is a SIGNIFICANT improvement over the Cascadia 11. The outsole is also notably wide, which provides excellent stability, without compromising agility. The Caldera is an incredibly smooth riding shoe. It is plush but not squishy and offers excellent support and stability. Response is moderate, the Caldera does not necessarily beg to go fast, but can easily handle faster paces when pushed. I ran in a wide variety of trail surfaces, just about anything you can imagine, steep rocky trails, some off trail, dirt roads, pavement, buttery singletrack and found the Caldera to be a wonderfully versatile shoe. It is protective yet flexible, well cushioned, so well cushioned that I came away from each run with my feet and legs feeling notably fresh. I found that with the extra volume of the upper, I would get a little bit of foot slide when pushing the Caldera in rocky, off camber, technical terrain, but it was limited, predictable and something that I could deal with. Those with a bit more foot volume will likely not notice. Though the Caldera is quite versatile, I feel that it shines most on more moderate terrain and less rocky surfaces. The Caldera makes a great choice for anyone looking for a well cushioned, stable, high mileage trainer/racer, especially for the Brooks fan who has found the Cascadia to be a bit too narrow and unforgiving. Brooks Caldera vs. Brooks Cascadia - The Caldera is lighter, more flexible, more forgiving, has a more accomodating fit, better tread grip (especially when wet), better cushion and better trail feel and response. 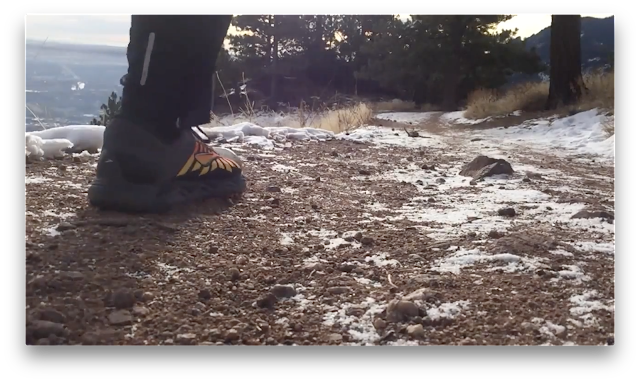 The Cascadia has better outsole durability for more rocky, rough terrain. Brooks Caldera vs. Hoka Challenger ATR 3 - These two shoes feel remarkably similar when I wear one on each foot. The Challenger is a few oz. lighter, has more cushion and has a 5mm offset vs. 4mm in the Caldera. The Caldera is slightly less quick and responsive, but perhaps a better pick for longer training days and/or slower paced ultra races. Caldera was provided at no charge to RoadTrailRun, The opinions herein are entirely the author's. Click Here for RTR's Latest Running Shoe and Gear Reviews, over 55 in 2016! The Caldera is available Now! This shoe looks interesting! Can you tell me how it compares to the New Balance Leadville? I own v2 of that shoe, and would describe it similarly. I do have the Leadville v2 also (one of my favorites) and I would say they are similarly cushioned/comfortable and appropriate for long distances. Performance is similar, neither is a dedicated speedster, but can handle just about anything. The Caldera is lighter which is nice, but the Leadville v2 has a more durable outsole, which is something to consider depending on your preferred terrain. The Caldera is certainly worth a try! How does the Caldera compare to the PI N3? Trying to decide between these two. Thanks! Hi John, I think it depends on your usage. If consistently on more rocky, technical terrain, I would lean toward the PI N3 (as long as you can still find them, given PI has discontinued their running shoe line). The Caldera is better suited for more moderate terrain, has a little softer cushion and is lighter weight. I have tried the Altra Lone Peak 3.0 and am really not sure it is for me. How does the ride of the Caldera compare to the Lone Peak? Also, do you have experience in the Timp yet? Thanks! While the Lone Peak 3.0 is a very nice shoe and I get the appeal, it just did not really work that well for my foot. The Caldera has a much more normal fit, slightly generous in the forefoot, but not overly so and foothold is good. The Caldera has a very smooth ride and is a bit more protective, especially if you heel strike (which I do some).